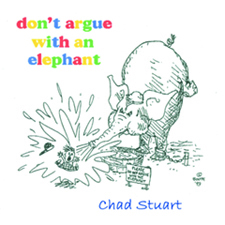 JR: Chad, you've just released a new solo CD for children, called "Don't Argue With An Elephant", but strictly speaking, it isn't actually "new", is it? CS: Far from it! I started coming up with songs for Beth & Beau when they were young. That's a while back! JR: Can you tell us a bit about the origins of "Elephant"? CS: Before I moved up to Sun Valley, I had been working on orchestrations for the California Youth Theater. This got me into the wacky world of digital work stations. All the tracks for "Elephant" were done on a Korg T-3. I love that keyboard. I've have a T-1 for years which is full size and has weighted keys. The T-3 is better for horns and reeds because you can get a more natural feel out of it. Back in Los Angeles, I was working with David Hemmings on a series he was directing. When he moved up to Sun Valley, he invited me to join him and collaborate on a musical. This project was another factor in getting me back into song writing. Of course, if you're a song writer and you have little people running round the house, it's a foregone conclusion that you're going to come up with material one way or the other, if only to sing the little blighters to sleep! JR: Whatever happened to that musical? CS: That's a topic for another interview! Suffice to say that it's still a work in progress. JR: So it is fair to say that the recordings on this CD led up to the modern C&J reunion? Or, put in another way, that this is you learning the tools of your trade in a new recording environment? CS: Yes and yes. Another big influence was Tom Hormel. I knew him from the L. A. days and it was a happy surprise to find that he had moved up to Sun Valley also. He had a fabulous midi studio and we collaborated on a Christmas album one year to raise money for a boy who was orphaned in a traffic accident. Tom was a huge help to me. Whenever he got a new piece of gear, he would pass on the old one to me. He gave me a pair of Mackie mixers and the Korg T-1. He basically started the studio. Before that, It was just the T-3 work station, a microphone and a four track recorder, but you do the best you can with what you have, right? JR: How long did it take to record the album? CS: I have no idea! It was a part time sort of thing. JR: One thing that strikes me about this record is the strength of your voice on certain songs. Is that simply because this album was largely recorded 15 years ago, or because singing with Jeremy requires a different skill-set? CS: I was younger and vocally stronger then, I'm sure, but it's also true that the Chad & Jeremy sound uses about half of what I'm capable of. If I used my full voice, I would overpower Jeremy completely. He has a vocal sound which is uniquely his, and I have to bear that in mind when we work together. Jeremy has a really strong chest voice when he wants to use it, but it sounds like South Pacific! ("There is nothing like a dame!") It's all John Barry's fault. He was the one who thought up that sotto voce thing. JR: Here we sit, only a few months after the release of the limited-edition "Fifty Years On..." CD, and with another Chad & Jeremy disc, "Live At The Don Gibson Theatre" on the horizon. What makes this the right time to release this unheard children's album? CS: It's one of those situations where you've made something available to family and friends and eventually enough people say stuff like, "What's the matter with you? Why are you hiding this?" It was a bit of a wake up call really. I have a huge back-log of songs, compositions and books. All of this material was put on hold after Jeremy returned in '03, but I've finally reached the rather obvious conclusion that time waits for no man. I've got to get all this stuff out there before it's too late. Now Or Never Productions! JR: The target audience for this CD is young kids, through their parents or grandparents who happen to be Chad & Jeremy fans. But is there enough in the music for the 'average' adult C&J fan to enjoy on it? CS: I didn't then and I don't now have a target audience in mind. The songs on this album (and there's a lot more to come, by the way!) reflect my musical and lyrical sense of humor and my attitude towards children. As an arranger, I had fun doing it. My inner child made this for the inner child in everyone else! JR: So it is fair to say you don't subscribe to the notion that we have to dumb things down in order to appeal to children? CS: Absolutely! I think cutesy kiddy stuff is a big turn-off. Kids are smarter than that. I also don't see the point in trying to cater to a particular age group. All I know is that my grandkids seem to like this album and that's good enough for me. JR: This release is available directly from www.chadandjeremy.com. Do you see bypassing traditional retail outlets as the 'way forward' to be able to reach your fans with more releases? Is there still a place for retail middlemen in the music market, rather than direct-to-fan marketing? CS: The record business would seem to be in the throes of trying to re-invent itself. I think that most artists, myself included, got such a raw deal from the old school record labels that we are looking forward to dancing on their graves! I think that we'll probably treat releases differently depending on their content. C&J albums will probably qualify for a so called retail approach whereas our solo projects or other specialty items might only be available on the website or as downloads. JR: Fans have heard talk about the so-called "Chad & Jeremy Vaults" for nearly a decade now. Without making any promises, is there a general feeling that it is time to start making more of the older material available to those who truly care about it? CS: The vaults contain two types of material. There are lots of old demos lying around which Jeremy regards as our private property. He gets a bit defensive whenever anyone threatens to drag them out into the light! The other category in the vaults are all the new tracks in various stages of completion. The big factor here is time and the lack of it. Everyone expects good old Chad to burn the midnight oil and meet all sorts of arbitrary deadlines. Well it ain't gonna happen folks. I've got a life and I intend to live it! That's not to say that things won't be completed eventually, but I'm not going to make promises I can't keep. JR: There is still plenty more to come in the way of new material, though? CS: I counted up all the basic tracks that Jeremy has laid down over the last few years and all I can say is that I'll never run out of new material! JR: Back to "Don't Argue With An Elephant", how do you think it will be received? CS: I have absolutely no idea! JR: So as long as the kids enjoy it, then you're satisfied? JR: Thank you for your time Chad, and for finally bringing an elephant out from its hiding place of too many years. This release is available exclusively on CD at Chad & Jeremy's Online Shop, or digitally via Chad & Jeremy's Digital Store powered by Nimbit.